To create an adaptive learning journey. And/or use them for the MemoTrainer. You can create learning objectives at several places, but the quickest way to do it is via the content library. It is a good idea to come up with learning objectives before creating questions in aNewSpring. First create a new content library (you can also use an old one, but a new one will make it easier) under the tab 'Content' (this can only be done by the administrator role) and create a new folder structure conform the learning objectives. 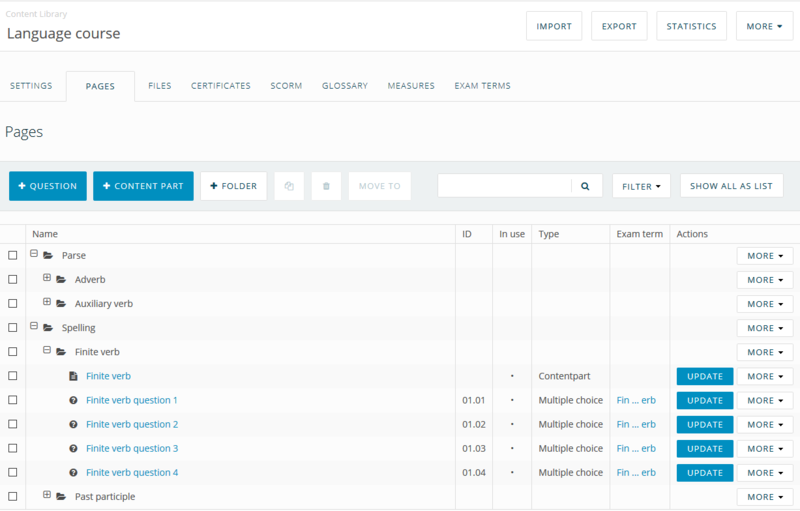 If you create a proper structure in the content library, you can use the folders that contain questions as the learning objective structure in the template with one single click. When you have created the structure, go to the tab Courses and click on Edit next to the template. Click on the tab Learning objectives to go to the learning objectives overview. If you have placed the questions in the proper folders (with learning objective names), you can use the folder structure as learning objectives by clicking on the rocket: 'Use the name of the folder from the content library which contains questions as objective'. Via the button + Learning objective you can also add learning objectives manually. Click on the red cross to delete a learning objective and on the icon next to it to rename a learning objective. Deleting is only possible if the template has not yet been published. Click on the tab To do and on Edit next to an activity. If you have selected questions via Activity content, you kan add learning objectives via the tab learning objectives. If you have created learning objectives as described in step 1 and have used the rocket as in step 2, then it is really easy to add the learning objectives to the questions you have selected. You can then click on the rocket: 'Use the name of the folder from the content library which contains questions as objective'. You can also add learning objectives manually by selecting the questions (click and drag to quickly select questions) and then by typing in the learning objective. Click on + Add. The learning objective can then also be found in the learning objective overview. 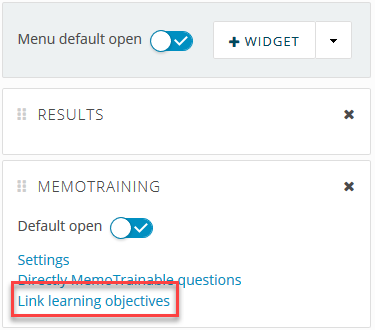 Click on Link learning objectives in the MemoTrainer widgets. Then again it is easy to link learning objectives if you have completed step 1 and clicked on the rocket as described in stap 2. Here again, you can click on the rocket: 'Use the name of the folder from the content library which contains questions as objective'. It is also possible to add learning objectives manually by selecting questions and choose a learning objective objective in the drop-down menu or by typing in a new learning objective. Click on the plus to add the learning objective. The learning objective can then also be found in the learning objective overview. If the template is allready published, it is not possible to add, change or delete learning objectives.